Singapore-born Chinese See Ewe Lay was a fifth-generation descendant of a wealthy Peranakan or Baba family in Malacca who founded Singapore's first Chinese daily newspaper, Lat Pau, in 1881. But See, who was proficient in English, was neither a Chinese scholar nor a writer from China. That perhaps made his motive behind the newspaper, also called Silat News, for a small local Chinese population then - mostly male and illiterate - questionable. There were suggestions that he, a dealer or agent for the Hong Kong and Shanghai Bank here then, did it simply for profit. But independent Singapore Chinese historian Kua Bak Lim, 68, in a talk in Mandarin yesterday, said his research showed that all the Chinese newspaper pioneer wanted was to encourage his fellow Chinese in the community at the time to remember their roots, raise social awareness and cultural standards. "Newspapers here in those early days could hardly make money, especially small circulating papers like Lat Pau which sold only 350 copies daily in the beginning," he explained. Not much was known about See's family or educational background, Mr Kua said, except that both his grandfather See Hood Kee, and father See Eng Wat, were prominent Chinese community leaders in Singapore in the early 19th century. "See Ewe Lay had probably studied in English schools before because in 1892 when he was nominated to the Municipal Commission by the colonial government, an English newspaper report even praised him for his proficiency in the language and popularity among the English-speaking community," he said. See's younger brother, Ewe Hock, was among a group of Chinese boys sent to the United States to study by the Qing government in 1874. He returned after studying at Boston University in 1881, but died later when serving in the Imperial Chinese navy during the Sino-French conflict in 1884. Mr Kua said the motive for Lat Pau's founder to start the paper, which folded in 1932, was among the "mysteries" in its short history of 51 years. 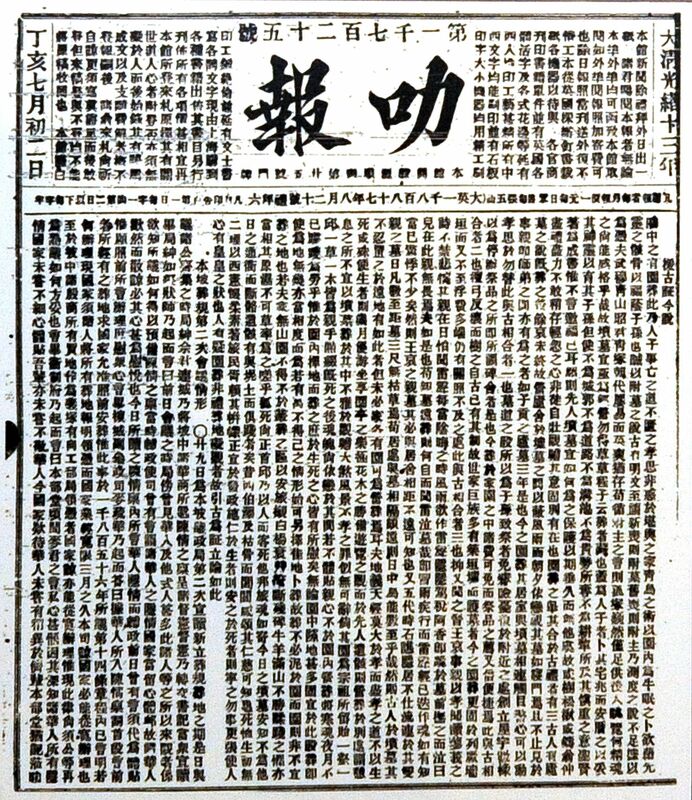 Other unanswered questions include why Lat Pau's chief writer and editor Ye Jiyun from China could stay with the paper for 40 years till his death in 1921, as well as the paper's exact inaugural publication date. When See Ewe Lay died suddenly of a heart attack in 1906, his eldest son, Tiow Hyong, took over the paper shortly before handing over the reins to his cousin, See Tiong Wah, in 1911. Mr Kua's talk yesterday was held in conjunction with the special exhibition, Early Chinese Newspapers in Singapore (1881-1942), which was launched at the Sun Yat Sen Nanyang Memorial Hall by Minister of Culture, Community and Youth Grace Fu last Saturday. In her speech, Ms Fu urged Chinese newspapers today to emulate and continue the traditions set by the early Chinese newspapers which were driven to improve the community and promote Chinese culture. More than 100 artefacts including books and reproductions of old newspapers, photographs and illustrations are among the exhibits at the exhibition at the memorial hall at 12, Tai Gin Road, which will run till Oct 9.